There's little that stands out about Jason Strudwick. At 6-foot-4 and 225 pounds, he's got great NHL size, and he's versatile enough to play forward and defense. But he's played 12 seasons for five teams, totaling 13 goals, 47 points, 736 penalty minutes and a minus-45 rating in 548 games with the Islanders, Canucks, Blackhawks, Rangers and Oilers. Strudwick isn't going to win any awards, so why has he lasted so long? His longevity revolves around being “good in the room” and accountable on the ice. Making it in the NHL isn't all about what happens on the ice. So much of it is about all the other things that go into turning a group of 23 men into a team. "He was a very popular guy, a funny guy and a character player on the ice," said Brendan Shanahan, who played with Strudwick for two seasons with the Rangers. Shanahan is just one of many players to rave about Strudwick, who has left a positive impression in every one of his stops. "I just try to be myself," Strudwick told NHL.com. "As you get older you realize there are certain roles on a team. Not everybody is going to be on the power play, not everybody is going to be the first guy on the shootout. I just help the guys be positive in the room." Strudwick always has been able to find the right chord to strike with teammates. "You must be running short on stories," Todd Bertuzzi told NHL.com when told a story was being written on Strudwick. They made the Islanders as rookies in the 1995-96 season, and were traded to the Canucks weeks apart in 1998. In all, they spent seven seasons as teammates, and roomed together on the road while with the Canucks. They remain friendly despite currently being on opposite sides of the Battle of Alberta. "We usually have a good battle," said Bertuzzi. "I remember the first game in Edmonton, we were around the net and I passed to Jarome (Iginla) and he threw it back to me and (Strudwick) threw it in his own net. We told him he finally scored." Bertuzzi told another story about how when they played in Vancouver, Strudwick used to hang from doors in hotel rooms to help his injured back. "He blew his back out and it was so bad I came in from practice … I vaguely remember him hanging from the door, and I had to swing the door open so he could get to the washroom." Strudwick takes the barbs in stride, because he never loses sight of one simple fact -- he's paid quite well to hang out with his friends and play a game for a living. "I just really enjoy the interaction with the guys on the team," Strudwick said. "I like to give guys a hard time and have fun with them. We work professionally, but at the same time it's a game, and sometimes as players you lose that focus a little bit. When things get a little bit too serious, things start to go a little hard, you want to keep it light. When it's time to play you have to be ready to go, but you can't be so tense that you can't play." There's a bit of irony there, as one classic Strudwick story shows what he can do when he can't play. "One time I was with Vancouver and we were having a bit of a slump and I got hurt the night before," Strudwick said. "I went to a mall in Minnesota and there was a Karaoke video machine you could use, and you could sing and dance and they would record you. So I was all by myself at the mall, I was the only guy who wasn't playing, so I did this to (Kool and The Gang's) 'Celebration,' I danced to it and I sang. I came back to my room, my roommate was Todd Bertuzzi at the time, he said, 'What's the video tape?' and I said, 'I'll tell you what -- if we win tonight I will play this video for you guys.' I was serious about it, but I didn't think he was going to tell anybody. But when I came to the rink, everyone was all fired up, we're going to win this game tonight so we can see it. "I just hurt my knee so I wasn't supposed to be dancing, so we win the game and right away all the guys are yelling at me to put it in. I didn't realize the GM, the assistant GM, all the coaches, scouts (were there), so they put it in and they played the whole thing and guys are just killing themselves (laughing). (GM) Brian Burke is yelling, 'Doesn't look like your knee's that bad, Strudwick.' It was good. It was fun. They actually played it on a pump-up video later. And they played it at my wedding. So it was pretty funny." Shanahan related a story from last season, when Strudwick scored his lone goal. "We were in Pittsburgh last year in OT and somehow he and Paul Mara led a rush while (Scott) Gomez and I were taking care of the back end. He bee-lined for the back-door post and got a pass from Paul Mara and put it into the net for the game-winner. He came out of the corner with his arms up and he said something along the lines of, 'You guys just take care of our end and let me do the rest.' It was just one of the funnier moments I've ever had on the ice." Strudwick played parts of two seasons with the Islanders, then spent five seasons in Vancouver. 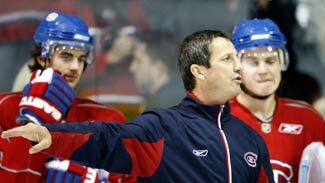 He spent 2002-04 with the Blackhawks, and after playing in Hungary during the 2004-05 lockout, he joined the Rangers. He started the 2006-07 season playing in Switzerland, but re-joined the Rangers later that season, and was there until this past summer, when the Edmonton native signed with the Oilers. In 60 games this season, he has 2 goals, a career-best 9 points and 58 penalty minutes. "I've really enjoyed my time in Edmonton," Strudwick said. "My wife and I live there in the offseason. I played in New York for a couple years and I enjoyed it there. I made a lot of friends on the team and off the ice. New York is a lot of activity, lot of action. I really enjoyed it while I was there. But going to Edmonton has been a really good move." It also allowed him to see some family members more often -- cousins Rob and Scott Niedermayer. "Oh, they talk about it all the time," joked Strudwick. Strudwick admits Scott, the four-time Stanley Cup champion, Norris Trophy winner and Anaheim Ducks captain is "a bit above the rest of us," but said the battles between he and Rob are fairly one-sided. "The only thing I would suggest is for Rob to lift more weights," said Strudwick. "When I play against him, it's pretty one-sided who takes who in the corner. He's probably a better skater, but it doesn't matter. When we get in the corner I just pin him, no problem." When told of his cousin's boasts, Rob said, "If the old rules could apply now, he could, because every time we go into the corner he takes a penalty because that's the only way he could control me." Strudwick's personality is something that hasn't changed over the years. "He's always had a pretty outgoing personality for sure," said Niedermayer. "Ever since we were young … every situation he goes into, he always makes the best of it. He always makes it a good time." Strudwick credited the Niedermayer brothers with inspiring him to reach the NHL. "When they were both 16, they were taking hockey really seriously and helped me narrow my focus, help me working out, on the ice, off the ice," Strudwick said. "As I turned pro they helped me make the transition from the minor leagues to pro, find ways to get better. They've been really great for me." And in turn, Strudwick has been great for his teammates. "He stuck up for guys and was one of those guys whose humor was self-deprecating," Shanahan said. "He was just one of the better teammates I've had in my career."